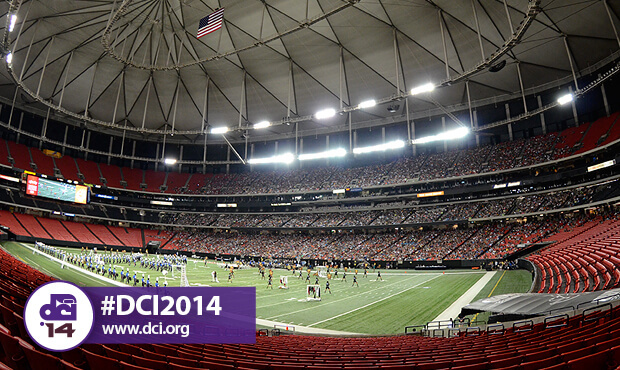 Blue Devils perform for a packed house at the Georgia Dome Saturday night. After a head-to-head throw down in San Antonio last week, all 22 of Drum Corps International's World Class ensembles met in Atlanta to do it all over again at the DCI Southeastern Championship on July 26. The event drew 16,695 people to the Georgia Dome, filling the stadium and setting a new record attendance. 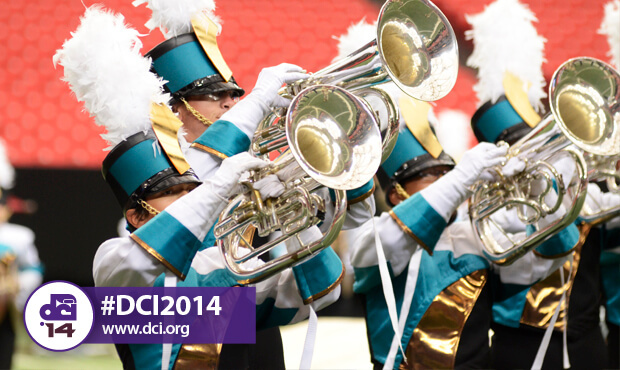 On the football field, Blue Devils proved they couldn't be stopped, once again taking home first place (95.100). The Concord corps has been working hard to keep hold of what's now a 21-event undefeated streak. "I think that from the start of the season, we've shown the most improvement in our focus," said fifth-year color guard captain Sam Madayag. "It was difficult, because from the very beginning we'd been thrown into this big production, but now that we're honed in, we've been able to master it." The Cadets took home second place (93.750), Bluecoats grabbed third (92.950) and Carolina Crown pushed into fourth (92.650) passing Santa Clara Vanguard (5th, 91.825) and leaving the Cavaliers to claim sixth (89.650). Blue Knights (7th, 88.600) passed Phantom Regiment (8th, 87.625) for the first time in more than a decade, after last doing so at the 2000 DCI World Championship Finals in College Park, Maryland. 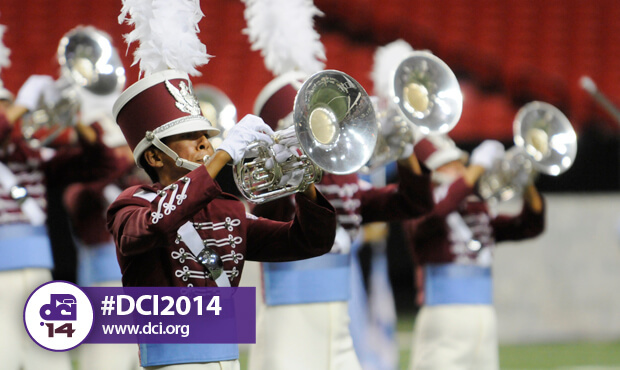 The Boston Crusaders (9th, 86.650) continued to intrigue audiences with their 2014 program, "Animal Farm." "Michael Lentz, our artistic director, has been working with the corps throughout the winter season, talking about how the show is put together conceptually. It's not a literal telling of 'Animal Farm,' but rather an interpretation that pulls some of the themes," said Boston's drum major Stephen Grindel. The Blue Stars (10th, 86.150) and Madison Scouts (11th, 84.950) have been back and forth in the placements, but tonight the Blue Stars took a 1.2-point lead over the Band of Brothers, the largest they've held all season. 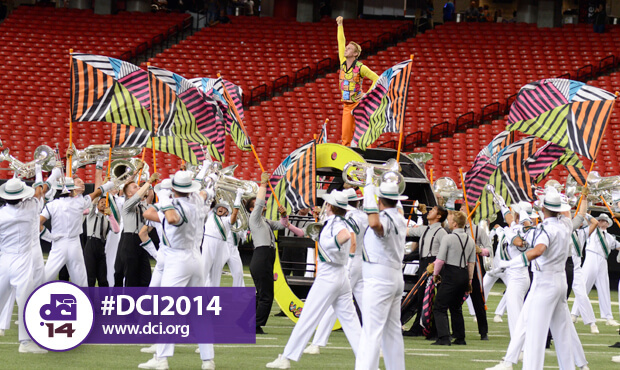 "This has really been a maturing process," said Madison Scouts front ensemble rookie Alex Hastings. "We started off as a pretty young group, but now I see the maturity of the corps and how we've grown in everything from our playing to how we load the truck." With strong performances tonight, Crossmen (12th, 83.050), Troopers (13th, 81.675) and Colts (14th, 80.925) are all vying for a spot among the top 12 corps that advance to the DCI World Championship Finals in August. Spirit of Atlanta (15th, 79.700) put forth a passionate performance for its hometown crowd, while the Academy finished in 16th place with a score of 79.000. Oregon Crusaders placed 17th (77.825) and brought a sinister performance of "Nevermore" to the Georgia Dome. Based on Edgar Allan Poe's poem "The Raven," the corps' production features foreboding narration and an electric string solo. "We were going for that eerie, darker feeling," said Oregon Crusaders drum major Anna Quenemoen, "The viola only strengthens those minor tones and themes that we perform." Pacific Crest's performance of "No Strings Attached" scored 76.125 putting the corps from Diamond Bar, California in 18th place. Another California corps, the Mandarins from Sacramento, found themselves in 19th place with a score of 75.225, just ahead of Jersey Surf who placed 20th and scored 72.175. Cascades members performed their 2014 program, "Turn" which follows the progression of the seasons from summer to spring as the musical arrangements move from medley to mash-up, each tune rolling over into the next. 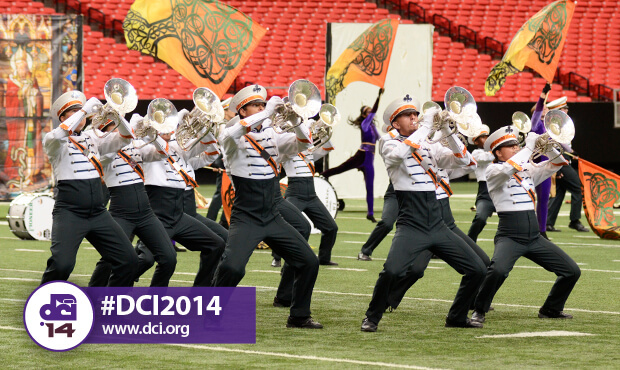 The corps from Seattle placed 21st, and broke 70 points for the first time this season (70.675). "Tonight was one of our better runs this far," said Cascades drum major Hayden Holbroo. "We've come so far from the beginning of the season, taking advantage of every one of our rehearsal days, working hard to build on the show and explore what this corps is capable of." 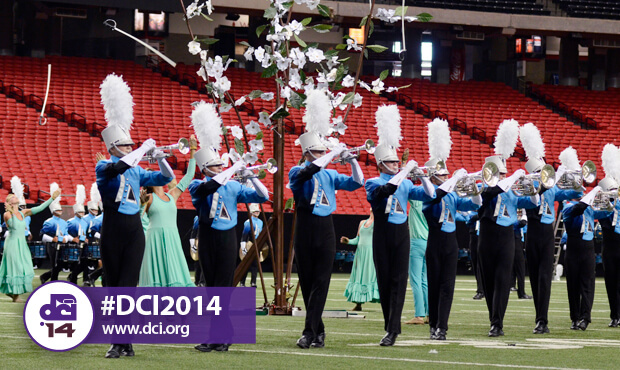 To round out the World Class competition in Atlanta, Pioneer received 22nd place with a score of 67.650. Two All-Age corps started the show on a sinister note with dark performances that held the audience captive. Carolina Gold performed "The Darkest Hour" in exhibition, and Atlanta CorpsVets scored an 80.350 with its 2014 program "Hex." Up next, the corps head north for upcoming shows in Charlotte, Charleston and Dublin, before meeting for a two-day split lineup in Allentown, Pennsylvania for the DCI Eastern Classic on Friday, Aug. 1 and Saturday, Aug. 2.